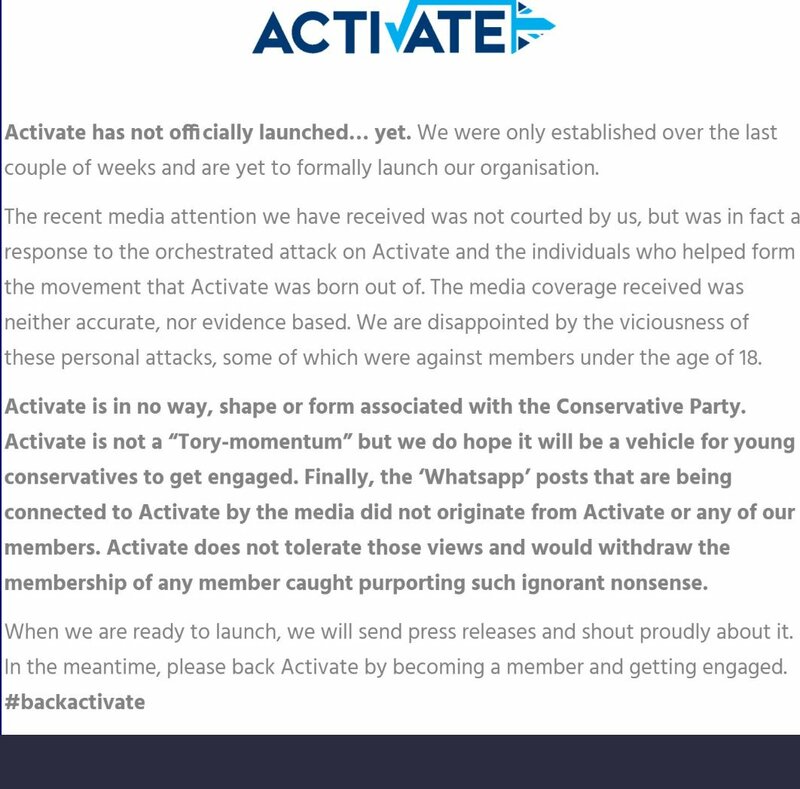 There’s no other way to describe it: Activate, allegedly the Tory version of Momentum, is in chaos – with allegations of ‘Nazi chat’ on WhatsApp followed by a denial from organisers that they are even up and running, despite having launched on Twitter earlier this week. Gassing chavs? Running medical experiments on them? That is not turning to a Nazi chat – it is Nazi language. Greater control of media and television? 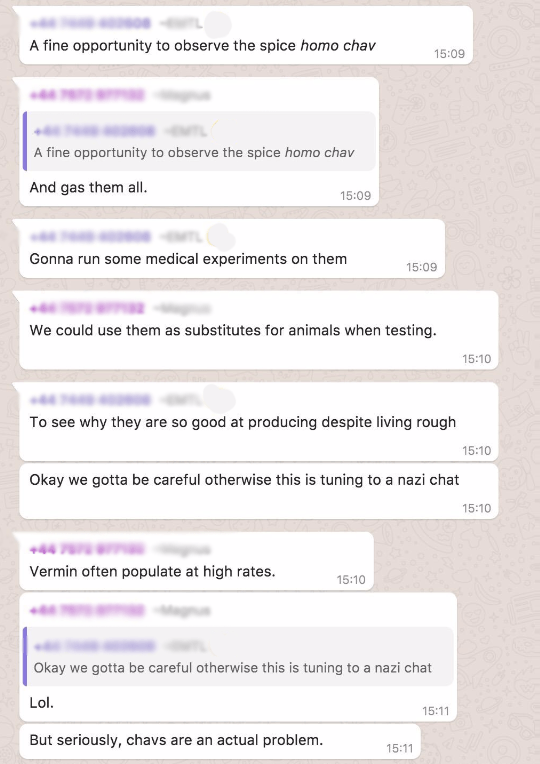 More Nazi chat. As is introducing compulsory birth control on – guess who? – chavs. 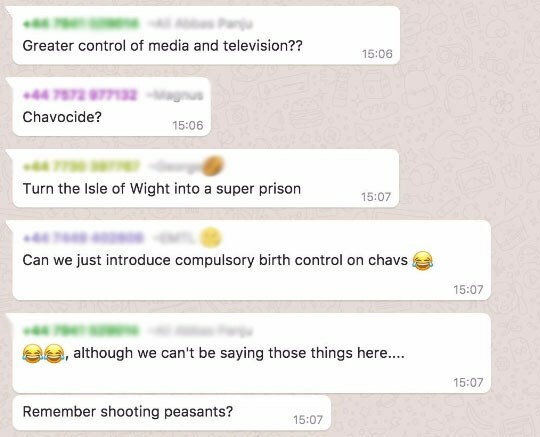 And what does one say about turning the Isle of Wight onto a “super prison” and “shooting peasants”? “Not officially launched” yet? Then why all the hullabaloo on Twitter? There’s a Facebook page, a website and a Twitter feed – all active… and a presence on WhatsApp, it seems. Or indeed, their constitution, which declares that Activate members are “expected to be members of the Conservative Party” and membership is “not compatible with membership of any registered political party other than the Conservative Party“? I ask merely for information. So it seems as though someone from Activate HQ (if it exists) has tried to be a voice of reason – but too late, because the chat has already turned up on the – and I stress this, right-wing – site mentioned in the last message. 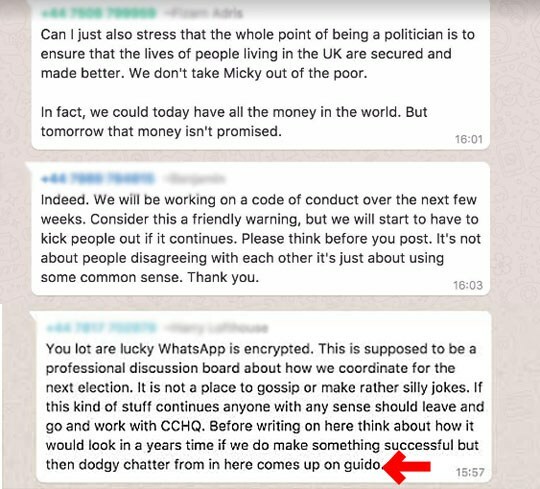 I wonder why no mainstream media journo has harangued @theresa_may into condemning the Tory youth wing "let's gas the chavs lol" group chat? Look, just because the Young Tories want to gas you, doesn't mean you shouldn't be friends with them, be mature about this. Perhaps they had a bad “felling” about their spelling? Or – no. It had to be a hack, right? Activate's Twitter account came under a successful hacking attempt at 15:34 today. The hacker has been identified & reported to the police. Our Conviction? It looks like a group suggesting the Tories should all be in jail. Keep your eyes on this one, folks – it can only get worse for the Conservatives. Join Activate, you might as well get free blue shirts and ties and have allegiance to one party, now I cannot help wondering why that reminds me of someone in History who did something similiar, wonder who!!!! Not a tory supporter but there is no reason to believe that some non tories haven’t gone on to the sites, posing as tories, and posted this stuff. Moderators don’t tend to be 24 hours a day cover. Evidence points in the other direction, it seems. Activate gives a pretty explicit idea of what the new generation of Tories has to offer the country.